(Nanowerk News) The University of Queensland's Associate Professor Lianzhou Wang has won a Scopus Young Researcher of the Year Award for his work on new nanomaterials for efficient solar energy conversion technology. Scopus Young Researcher of the Year Award recipient Associate Professor Wang Associate Professor Wang joined finalists in Sydney this week for the award announcements and took out the category for Engineering and Technology. His research is expected to have a profound impact on the use of nanomaterials in improving sustainability in applications such as water and air purification, solar cells, self-cleaning coatings and hydrogen production from solar energy. Associate Professor Wang, from UQ's School of Chemical Engineering and the ARC Centre of Excellence for Functional Nanomaterials, is the first academic from UQ to receive an award of this kind. "It is extremely humbling to receive this award in recognition of the research I have undertaken," Associate Professor Wang said. "I hope to further my research within the sustainable energy industry." The Scopus Young Researcher Awards recognise researchers under the age of 40 who have undertaken an outstanding research project at an Australian university. Associate Professor Wang received the award for developing a new strategy to design highly visible-light active nanomaterials, which underpin many important applications such as water and air purification, new generation solar cells, self-cleaning coatings and hydrogen production from water splitting through use of abundant solar energy. The research conducted by Associate Professor Wang and his team focuses on synthesis, characterisation and applications of functional nanomaterials – through which a number of significant contributions to clean and renewable energy conversion systems have been made. Executive Dean of the Faculty of Engineering, Architecture and Information Technology (EAIT), Professor Graham Schaffer, congratulated Associate Professor Wang on his achievement. 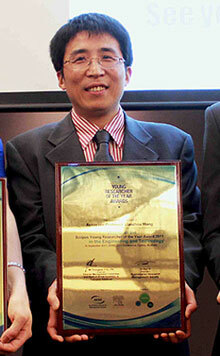 "It is very exciting to see Associate Professor Wang be rewarded for his high-quality research," he said. "The award is a true reflection of his work's significance in the sustainable energy sector."